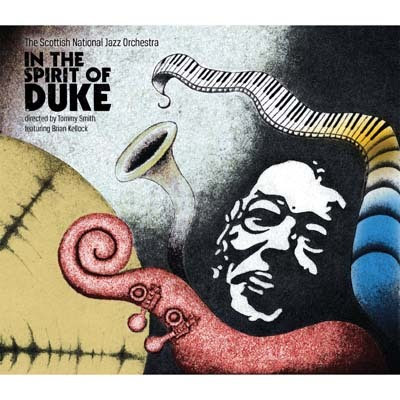 This disc is a selection of live recordings of the Scottish National Jazz Orchestra’s autumn 2012 Ellington tour. It’s also a culmination of band leader and saxophonist Tommy Smith’s increasingly intimate and exciting acquaintance with Ellington’s music, which began with his 1997 album The Sound of Love and included a period playing alongside Ellington veterans in the Ellington Legacy Orchestra in 1999. It’s doubly important as a project: Ellington tours are always valuable in bringing new audiences to the increasingly rare and precarious world of live big band, while recordings of his music are vital in retaining his influence as an elemental part of the jazz tradition. Compared to the prolific tributes and reinterpretations of, for example, Davis or Coltrane, there’s not much new music that incorporates Ellington. For such a colossal, and entertaining figure, that’s a shame. Smith, just old enough to have played with survivors of Ellington’s orchestra, is ideally placed to make Ellington’s case in a modern idiom. His choice of tracks for this disc is interestingly diverse, with every stage of the Duke’s career, from exuberant 1920s favourites like ‘Creole Love Call’ to some of the less well-known suites - especially the Queen’s Suite, composed after Ellington met the Queen in Leeds in 1958, and Ellington’s adaptations of Norwegian composer Grieg - from the last two decades of his career. It hardly needs saying that an ensemble of this quality give a superb technical performance, the ensemble remaining well glued, despite their wild rhythmic tensions. The live sound is fresh and exciting, and the spirit of the gigs is compelling. Comparing original recordings with the SNJO’s versions is fascinating, though conclusions must always be personal. The immediacy of the new recording inevitably does the SNJO a favour in any comparison, giving the brass sound a brighter, citrus lustre, and revealing more of the music’s texture. I prefer the SNJO’s ‘Sepia Panorama’; Tommy Smith takes a crisper tempo than the slightly laboured Ellington original (the recording I have, anyway), and the brass sound gleams, and the rhythm pulses aggressively. Just for once, Ellington’s band sounds a bit flat in comparison. ‘Black and Tan Fantasy’, on the other hand, lacked, for me, the extravagant swagger of Ellington’s version. There’s something deliciously malevolent about Bubber Miley’s sneering muted trumpet in Duke’s version that the SNJO, for all of its polish, can’t quite match. It’s too polite, perhaps. The SNJO creates a magnificent train in ‘Daybreak Express’, its more elastic tempos accelerating with relentless menace and exhilaration, while Ryan Quigley’s trumpet squeals and screams with glee. Ellington’s train sounds rather underpowered by contrast. Of the less familiar material, the Grieg arrangements - according to Tommy Smith’s note, banned in Norway on release in 1960 - stand up better than The Queen’s Suite. This last piece, though interesting, is surely one of Ellington’s least original. It seems, perhaps because of its regal inspiration, to be aspiring to delicacy and prettiness. For all the big band’s merits, are surely the tones in which it has least to offer. There are superb solos from most of the band. As well, of course, as Smith himself, who maintains order with the lightest of touches, and smoulders on sax, Ryan Quigley is acrobatically outstanding on trumpet, and Martin Kershaw on clarinet/sax perhaps stand out most. Ruaraidh Pattison, on his first SNJO tour, is irresistible in ‘Prelude to a Kiss’. And in several tracks, particularly ‘Le Sucrier Velours’ and ‘The Single Petal of a Rose’, Brian Kellock on piano leads with a perfect combination of authority and sensitivity. This disc is a valuable piece of Ellingtonia for the dedicated fan, essential both for the range of its selection and the skill of execution. Whichever way their preferences fall between SNJO and Ellington, listeners are guaranteed an enjoyable time comparing tracks, and savouring the SNJO’s new perspectives. Sufficient time has now elapsed since pre-bop originals were performed that for much of the audience it feels, arguably, more like a re-interpretation of archival material than a continuation of a tradition. The January debut of Chris Batchelor’s extraordinary new band Pigfoot, which part celebrates and part deconstructs the traditional repertoire was perhaps a turning point. The SNJO plays straighter than that, but even if it’s just in the brightness and freshness of the sound, there’s a revelatory sense of rediscovery, like seeing a newly restored old master scrubbed of its familiar grimy layers, emerge and astonish viewers newly.